For many years we’ve considered going to Hawaii; but our images of Waikiki with buildings over-shadowing the beach, hordes of tourists, chains of shops and restaurants turned us off going. We love beach holidays but we love quiet ones. Staying in cabanas or bungalows rather than one of a thousand condos. Then after some more research we realised that Waikiki is not representative of Hawaii. 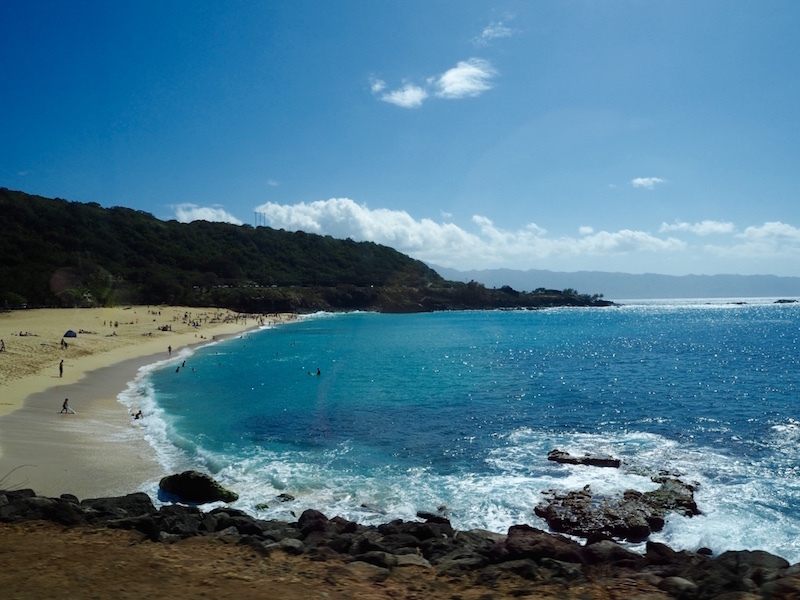 There is much more to Hawaii or even Oahu than Waikiki Beach. After a lot of reading and recommendations from friends we decided to check out Maui and Kauai, but flying there from Melbourne meant a transfer in Honolulu was inevitable. Since we were flying into Honolulu we thought it was worth stopping over for a couple of days to find out if Waikiki was really as bad as we expected. 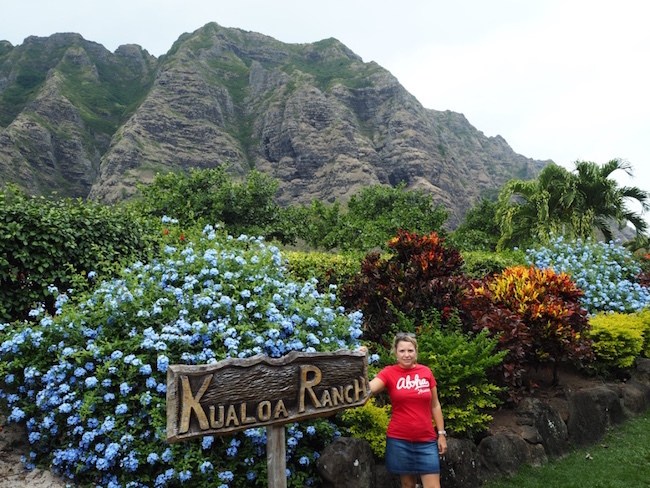 And of course, we thought we should check out some sights of Oahu at the same time. We had a total of three nights in Honolulu – two nights on the way in and one night on the way out. 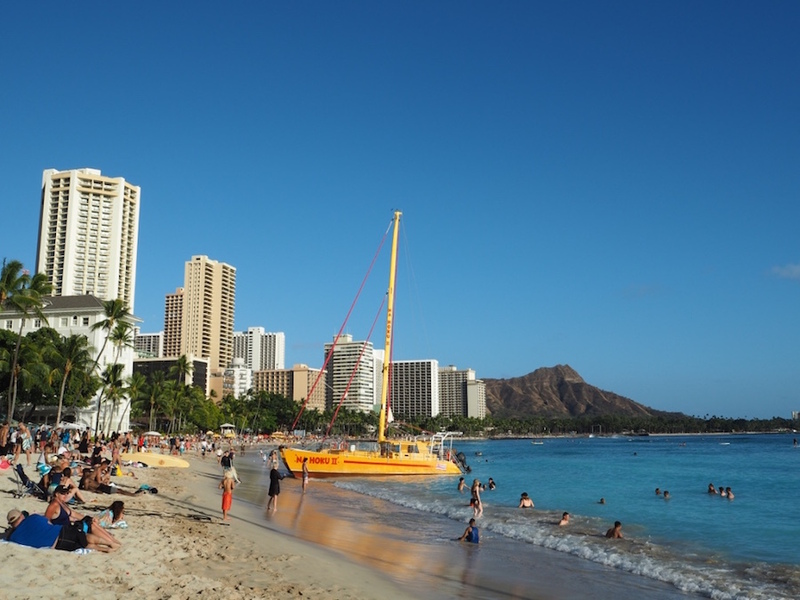 For our first two days we decided to stay right on Waikiki beach to see what all the hype was about. 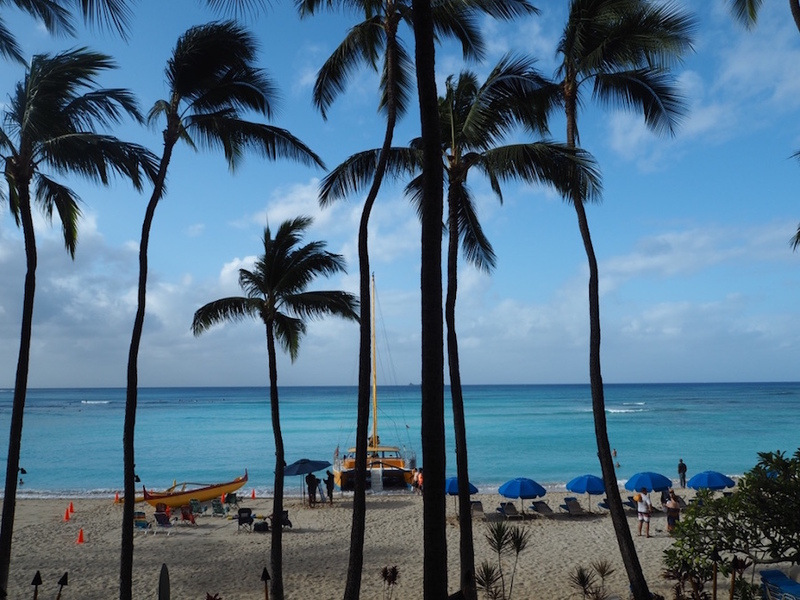 We stayed at the Outrigger Waikiki Beach and as soon as we arrived around breakfast time we were nicely greeted with Alohas and smiles. Check in being at three in the afternoon we were pleasantly surprised when they gave us a room straight away at no extra charge. That was very much appreciated after an overnight flight! Our room had a view on the beach and at that time in the morning it still felt relatively quiet down there. The madness had not yet begun and it just didn’t seem that bad. 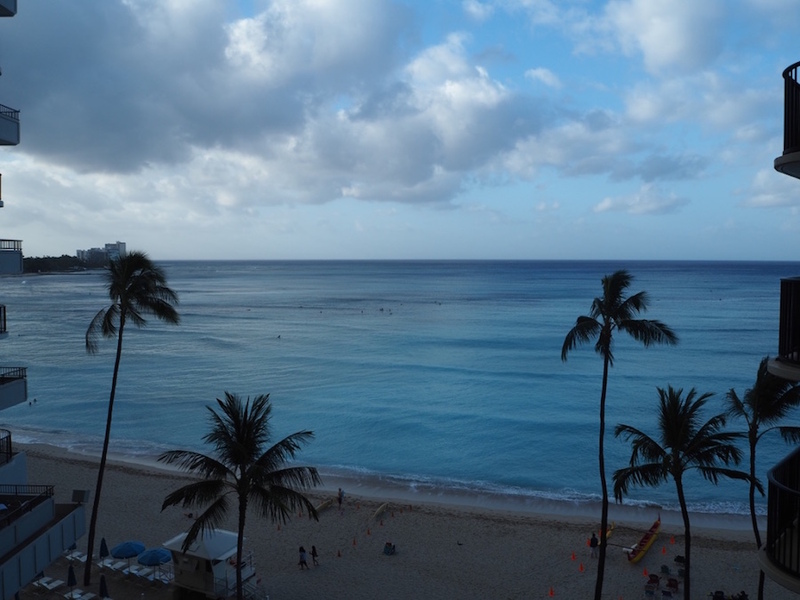 View from our room over Waikiki Beach. Very quiet after sunrise! By the time we showered and had breakfast the beach was already starting to become busy. Many people were lying on the lounge chairs ready for a day of basking in the sun. That wasn’t really on our agenda though. Since we had such a short amount of time on Oahu we wanted to explore some of it too. Sunbathing could wait. Instead, we took the number 22 bus to Hanauma Bay for some snorkelling. 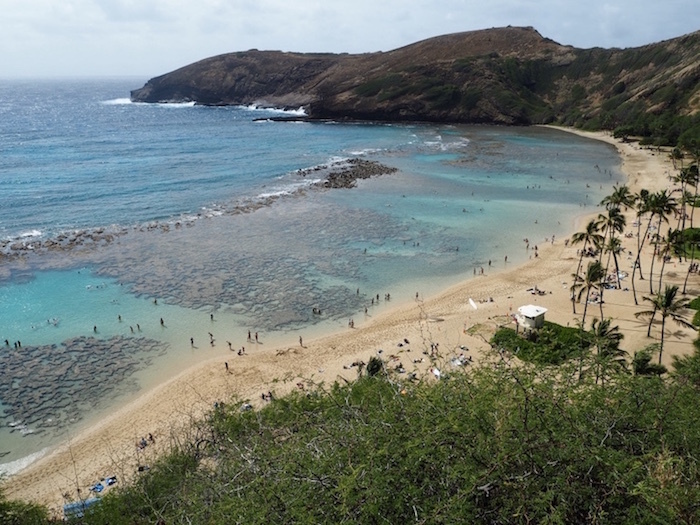 Hanauma Bay is about thirty minutes by bus from Waikiki. 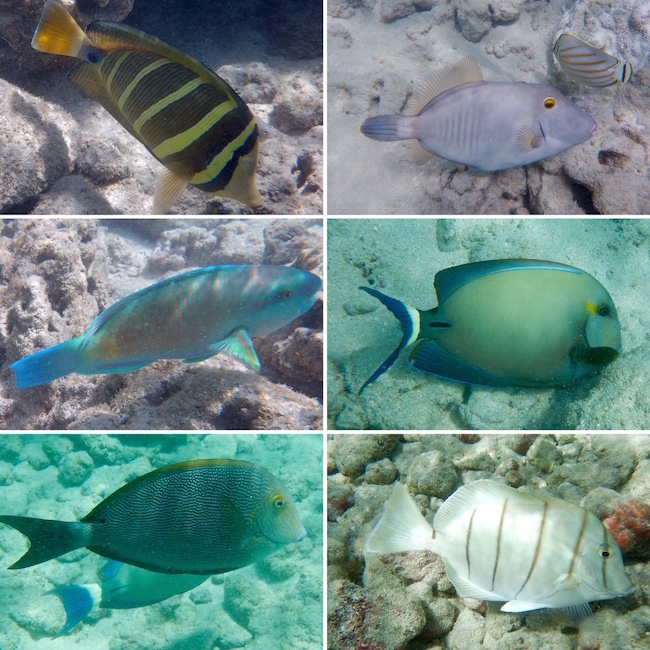 It is supposed to have some of the most accessible snorkelling in the whole of Hawaii. Check out the bus timetable to save some time as we had to wait more than half an hour for a bus having just missed one! From the top of the hill overlooking the bay you get to enjoy an amazing view. It was stunning and the water seemed so inviting we couldn’t wait to jump right in. There is an entrance fee of $7.50 and a compulsory ten minute video on safe and environmentally friendly snorkelling to watch before you can finally make your way down to the beach. Well the snorkelling was fantastic, heaps of fish of all different colours and sizes. The water was also really clear. We arrived when the tide was very low so there wasn’t as much marine life as there could have been (we didn’t see any turtles) but we still consider it one of the best snorkelling sessions we have had. We would definitely go back if we returned to Oahu. Next time we would go first thing in the morning to avoid the crowds and to make sure the tide is high! Either way it was the highlight of our stay on Oahu. After a few hours of snorkelling fun we caught the bus back to Waikiki and spent the rest of the afternoon in Waikiki checking out the area. By the time we got back Waikiki beach was well and truly crowded! There were beach goers everywhere, and paddle boarders and surfers in the water. The beach bars were all full of holiday-makers sipping Mai Tais! Was it bad? Believe it or not I actually enjoyed it! We ourselves sat down for a couple of cocktails while we took on the lively scene around us! Mai Tai and beer flight at Duke’s! 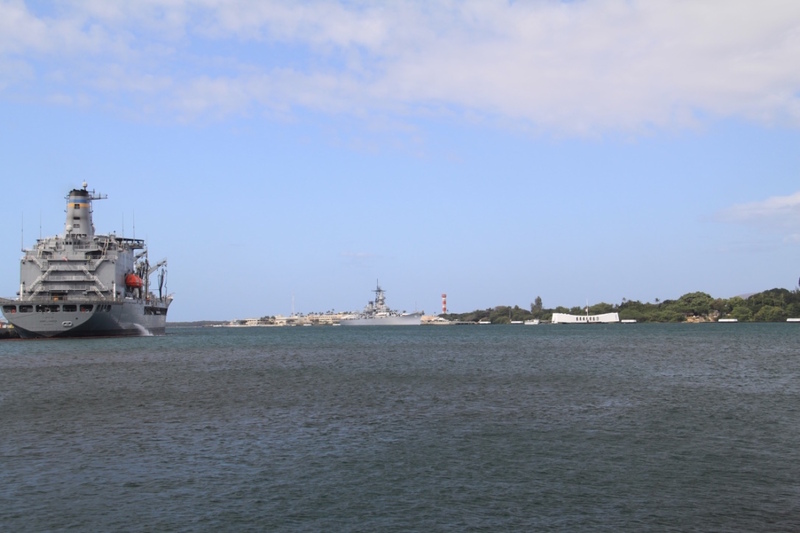 On our second day we joined a Pearl Harbour and Circle Island Tour with Polynesian Adventures. We couldn’t go to Honolulu and not do Pearl Harbour. We were really looking forward to it as we had also recently visited the memorial at Hiroshima. Unfortunately on the day we went it was really windy. The last few days on the island had been extremely windy and for safety reasons when it is windy they cancel all boat trips out to the Memorial. We were extremely disappointed to say the least. We still took the time to check out the museum, walk around the grounds and watch the moving video presentation which were really well done but it was a real shame to miss out on the memorial. Oh well I guess that gives us the opportunity to come back to Oahu another time! The closest we got to the Peal Harbour memorial… Very disappointing. Our trip carried on and we made a few stop around the island. 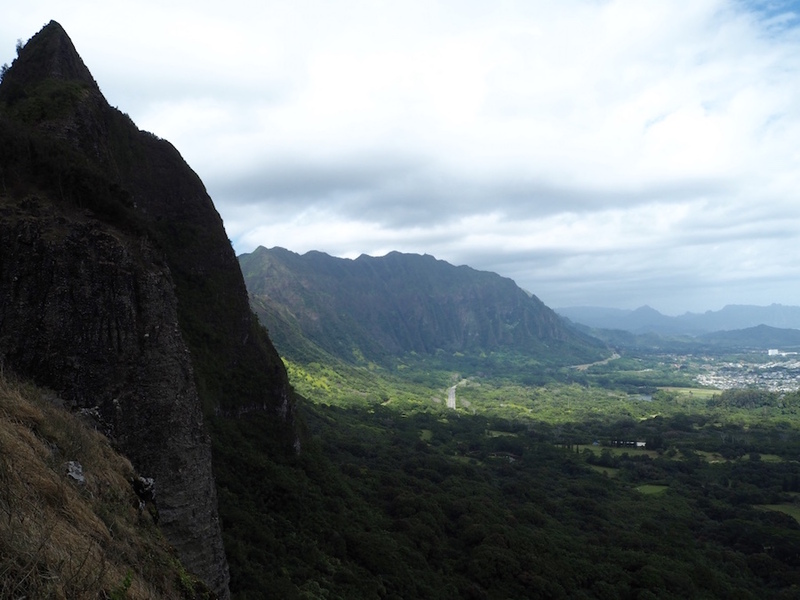 The first stop was the Pali lookout. It had a very nice view of the valley. However the wind was so strong and so cold that suddenly it felt more like Canada than Hawaii! 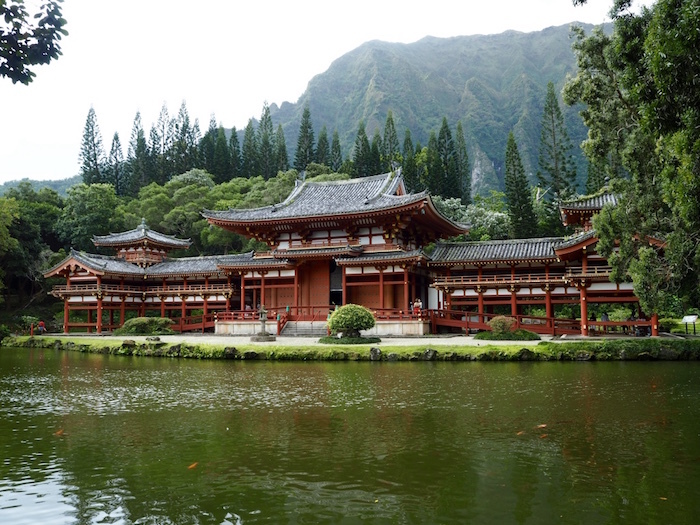 Our second stop was the Byodo-In temple. We really loved that temple. The location is stunning, nestled at the foot of some gorgeous mountains. The mist made the temple look even more amazing. Simon was really into the koi fish which he spent almost the whole time photographing! Our lunch break was at the Kualoa Ranch. The food was far from amazing but the stop was worth it just for the view! They offer many activities around the ranch like horse riding, zip lining and ATV tours, which would have been amazing if had had more time. Great view at Kuloa Ranch. In the afternoon we drove past the Northern Beaches. Sadly we didn’t stop at any of them which was really disappointing. Commercial vehicles are apparently not allowed to stop there anymore. The Northern beaches are all about the surfing and they did look pretty rough! Surfing competitions happen on the North Shore of Oahu every year. In winter, those beaches are way too dangerous for swimming. If you are an experienced surfer though you’d have some real fun! Our last stop was the Dole Plantation. 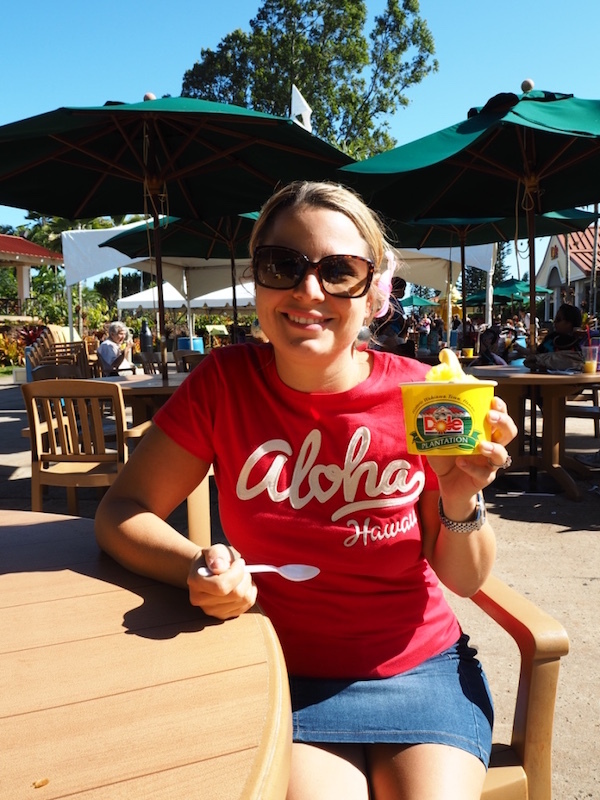 The Dole Whip was really delicious but unless you are prepared to wait in line for it or if you have children I would give this stop a miss. At the end of our Hawaiian adventure (see our blog on Maui and Kauai) we came back to Honolulu for one last day. Since we didn’t get a chance to climb it during our first two days we decided to hike the Diamond Head Crater. Try and go early as it gets hot and incredibly busy. Entry is only a dollar for pedestrians (once again it’s easy to take the bus) and it’s a great hike. There is a steep hill to walk up and quite a few stairs but it isn’t too strenuous for the average level of fitness; just take your time. 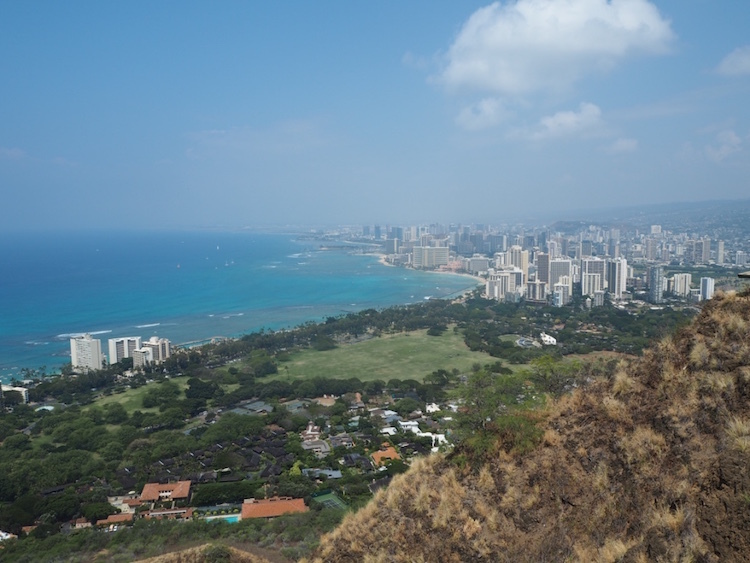 The views of Honolulu and Waikiki from the top are a great reward for your efforts! We stayed at the Ala Moana Hotel across from the Ala Moana Shopping Centre on our last night because we were planning on doing a lot of shopping on our way back. Turns out we had already shopped so much in the other islands that we had ran out of space and were a bit shopped out. We did walk around the shopping Centre though and it is huge, with many shops from expensive designers to smaller boutiques. It does seem like the perfect place to shop if you have a lot of time and money! Instead we went for a swim at the Ala Moana Beach Park. 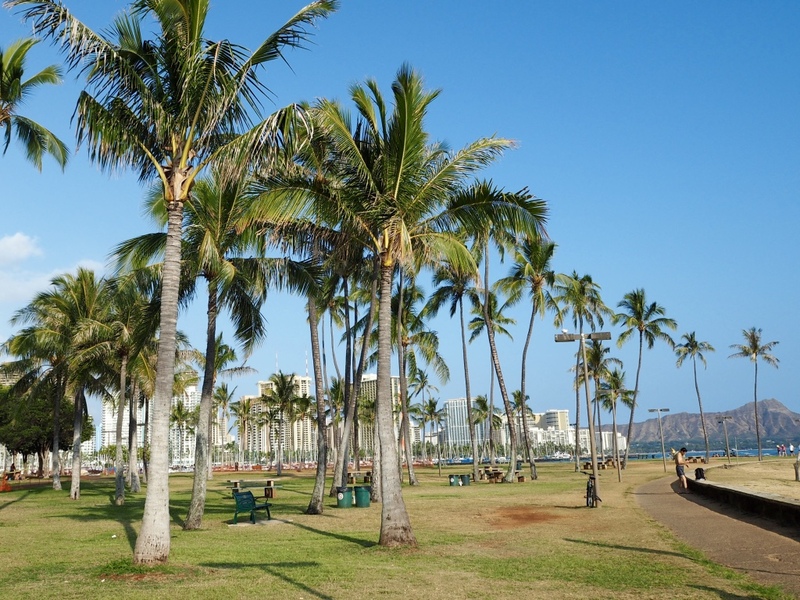 The Ala Moana Beach Park is a palm tree filled park that leads down to a nice beach across the road from the shopping centre. It is nicer than Waikiki, much less touristy, and many locals frequent this beach and have family charcoal barbecues in the park next door. A walk to Magic Island next to the beach gives you a great view of Waikiki and the Diamond Head Crater. Take a stroll there at sunset for some great photos! Magic Island Lagoon is also a great place to swim. 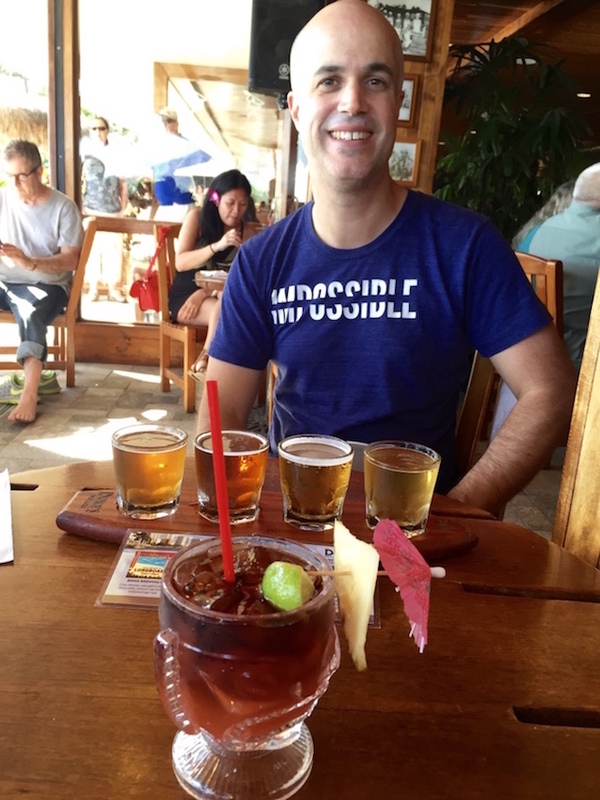 So was our stay in Waikiki really that terrible? Not at all. We will definitely go back to Oahu. We would also happily spend another couple of days in Waikiki at the start/end of another trip around the islands. It was nice to have a bit of nightlife and shops at our door steps at the start and end of our holiday. It was also a good base to explore the rest of Oahu. We still very much prefer less touristy and less commercialised places though. Each to their own I guess.